Fly from the vibrant city of Mumbai, to the spectacular city of Hong Kong only on the best Mumbai to Hong Kong flights. Check out our affordable rates on international flight bookings, only with us. Get complete details on your flight schedule, status and low cost airlines for your Mumbai to Hong Kong flights. Looking for cheap Mumbai to Hong Kong flight tickets? Now you can search and book Mumbai to Hong Kong flight tickets on www.akbartravels.com. Akbar Travels makes it easier to book flight tickets by giving you access to a range of tools like Mumbai to Hong Kong flights schedule and Mumbai to Hong Kong Airfare Calendar. Apart from this, Akbar Travels price alert feature ensures you get the cheapest fare for Mumbai to Hong Kong flight ticket every single time! Whether you are booking a one-way flight ticket from Mumbai to Hong Kong or a return ticket, you can rest assured on getting the best deals and offers on Mumbai to Hong Kong flight tickets. Several reputed airlines like Air Japan, Emirates, Air India, Air Asia, Ethiopian Airlines, Hong Kong Airlines, Thai Airways, SpiceJet, Cathay Pacific and many more offer both direct and indirect flights between the two destinations. Booking Mumbai to Hong Kong flight ticket online gives you several benefits like insurance, 24/7 customer support, reward points and access to multiple airlines. Akbar Travels offers you the widest choice of airlines for Mumbai to Hong Kong flights. So you can choose your most preferred day, time and number of stops for your flight. So why wait? Book the best deals and offers on flights from Mumbai to Hong Kong only on www.akbartravels.com today! 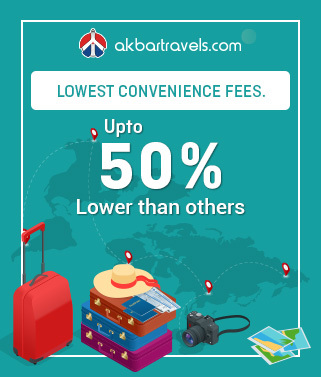 Find the best deals on Mumbai to Hong Kong flight tickets on www.akbartravels.com and book your flights at the lowest airfare along with benefits like instant confirmation, airfare calendar, easy cancellation/refund and lowest convenience fee. Hong Kong may be a city of skyscrapers and fast-paced living, but it also holds a strong local culture. While the cityscapes here are quite enthralling, the city also offers beautiful natural landscapes of mountains, beaches and country parks. Currently, as the world’s 7th largest trading country, Hong Kong is an important global financial center. The Hong Kong dollar is a flourished currency, and the population enjoys simple tax policy. The per capita income of Hong Kong is also one of the highest in the world. Hence, it is a fast-paced cosmopolitan city that attracts tourists with its exciting, lively and dynamic vibes. It is also a city filled with talented instrumentalists and filmmakers, a flourishing art scene, local markets, and an extravagant nightlife. So why wait? Soak up Hong Kong’s diverse culture by going for an Asian film festival or by visiting the city’s rich museums and concert halls. From posh malls to sprawling markets, local bazaars, and boutiques, you’ll find it all in this city. One of the best things about Hong Kong is that while the soul of the city may seem relatable to that of New York or London, its heart remains Asian. Hong Kong International Airport - 1 Sky Plaza Road, Chek Lap Kok, Hong Kong. Located on the seaside, Hong Kong has a diversity of weather conditions and is subjected to cyclones as well during the rainy season. Hong Kong is located in the Subtropical region, hence making it an all year destination. Though summers are really hot and can preferably be avoided. Winters are cool making it the most ideal weather to visit Hong Kong. In addition to that, the autumn season is also a pleasant time to visit Hong Kong. The cool evenings, enjoyable breeze blowing all through the day, reasonable temperatures and the right amount of sunshine make this a really the best time to visit Hong Kong. Avoid visiting during the time of the Chinese New Year as then many shops will be closed. There are only 2 airports in Hong Kong; one is the Hong Kong International Airport in Chek Lap Kok and the other one is in Sheh Kong which is the Sheh Kong Airfield. Many flights operate from here. The most common flights here are Cathay Pacific, Euro flights, Air India, Emirate Flights and many more. The only railway station in Hong Kong is situated on No. 9 Cheong Wan Road, near to the Coliseum. Bullet trains linking various cities of China to Hong Kong are available here. Hong Kong has the best bus transport system. The system is very convenient and reasonable. The E is external bus services, NA are overnight express services, N are overnight services, A routed are air buses and S routes are shuttle bus services. The buses can be used to reach a close metro station or to a particular destination. Cab and taxi services are also available. Whether you’re a first-time explorer or a seasoned traveller, these are the essential things to see, do, eat and drink while you’re in Hong Kong. From the most attractive hiking trails in Hong Kong to the city’s finest museums, here’s a complete guide to the very best experiences in the city. 1.Which months have the lowest fare for the Mumbai to Hong Kong flights? The cheapest months for the Mumbai to Hong Kong flights is September. 2.Which is the best month to travel to Hong Kong? The month of spring, such as October to early December, when the weather is sunny, cool, and pleasant is the best time to visit Hong Kong. Hong Kong can also be visited all throughout the year because of its sub-tropical location. Hong Kong International airport is located at a distance of 30 km from the city of Kowloon. You can connect to the city of through public buses, airport express trains, taxis, Airport shuttle services and private vehicles. 5.What are the currency of Hong Kong and its approximate conversion rate? The currency used in Hong Kong is Hong Kong dollar (HKD). 1 HKD is approximately valued at 8.36 Indian Rupees. You can check the currency conversion centres for more details. 6.What is the time difference between Mumbai to Hong Kong? The time difference between Mumbai and Hong Kong is approximately 2 hour and 30 minutes. Hong Kong is ahead of Mumbai by 2 hours and 30 minutes..
1.What are the airline brands that offer Mumbai to Hong Kong flights? The airline brands that offer the Mumbai to Hong Kong flights include Cathay Pacific, Jet Airways, Air India, Singapore Airlines, Malindo Air, Thai Airways, Malaysian Airways, China Eastern Airways and Korean airways, Emirates and Asiana Airways. 2.How many weekly flights are there from Mumbai to Hong Kong? There are approximately 18 flights weekly from Mumbai to Hong Kong. 3.At what time does the first flight leave from the Mumbai to Hong Kong? The last Mumbai to Hong Kong flight is at 10:30 PM which isCathay Pacific. 5.What are the airport codes of Mumbai to Hong Kong? The airport code of Mumbai is BOM and Hong Kong is HKG respectively. The name of the airport in Mumbai is Chatrapati Shivaji International Airport. 7.What is the name of the airport in Hong Kong? The name of the primary airport in Hong Kong isChek Lap Kok Hong Kong International Airport.